Samsung, the Godzilla of the mobile world, and Google, the pioneer of smartphone Operating System, have been partners for long. However, the tables have turned and now the two pillars of Android based smart phones are at loggerheads with their respective new-age mobile phones, Samsung with its latest Galaxy Note 4 and Google in partnership with Motorola with its Nexus 6. Both the companies have put in their best to make their respective offering to be the defining Android device and none wants to blink an eye and share profits, love, and fame. Although, both the high end devices are from different makers, Samsung & Google (Motorola), they are amazingly alike. Both Samsung Galaxy Note 4 and Google Nexus 6 have a solid metal frame and are covered with a soft plastic back. In front, there is a large AMOLED screen with slim bezels. Both the phones have powerful chipsets and quality cameras. A few features may seem similar; however, both the phones have their own advantages. Let’s check the features in detail. As stated above both the phones have AMOLED screen panel with large display screens. Both the phones display rich and vibrant colors with deep blacks and wide viewing angles. In the quest of conquering the market, makers of both the phones have tried their best to deliver well-designed phones. As mentioned before, both the phones can brag about their powerful chipset. The driving hearts of Galaxy Note 4 and Nexus 6 are identical. Samsung Galaxy Note 4 comes with TouchWiz that is a fat, overstuffed feature slowing down the Operating System and hence the phone. It also wastes a lot of space with futile, non-removable apps. On the other hand the stock Android that comes with Google Nexus 6 is fast, sleek, and makes navigation easier. You can argue that the cameras of both these phablets are two of the finest smartphone cameras available in the market. On paper, Galaxy Note 4 may look appealing, but Nexus 6 may edge it in longer terms, despite being on the lower side. While you get pleased by the camera quality of Nexus 6, the battery backup might put you off. Though, on paper it is virtually identical to Note 4, just wished it to be practically same as well. 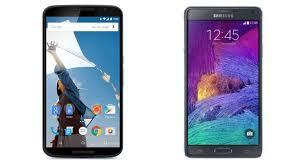 Samsung Galaxy Note 4 vs Google Nexus 6, both are big phones from big players with very different propositions. Although, both of them matchup in a lot of things, they both have very different pros and cons. Thus, it is your decision to choose one of the two phablets.